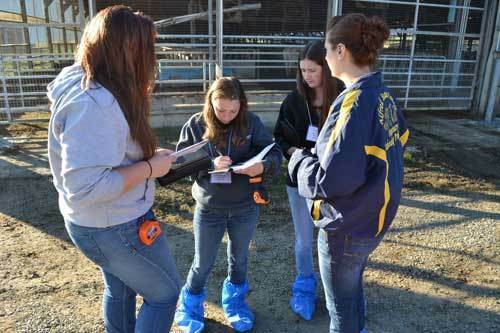 (From left to right) Sarah Meyers, a mentor from AgChoice Farm Credit, and students Breana Scribner of SUNY Cobleskill, Jaylene Lesher of Penn State University and Kohlton Butler of Vermont Technical College take notes on the heifer facilities while evaluating Ti Glo Farm in Howard, Pa.
(From left to right) Naomi Kenny of Morrisville State College, Ashley Howlett of Cornell University, Britney Hill of SUNY Cobleskill, and Erica Boutelle of Alfred State College discuss their farm evaluation of Willow Behrer Farms during the Northeast Regional Dairy Challenge. Students visit and evaluate Schrack Farms during the Northeast Regional Dairy Challenge. Participants, sponsors and planning committee members of the 2014 Northeast Regional Dairy Challenge in State College, PA.
Students on Team 7 � Holtz-Nelson Dairy Consultants, LLC earned first place among teams evaluating Schrack Farms of Loganton, Pa. Front row (left to right): Gabrielle Domagala, SUNY Cobleskill; Joshua Landis, Cornell University. 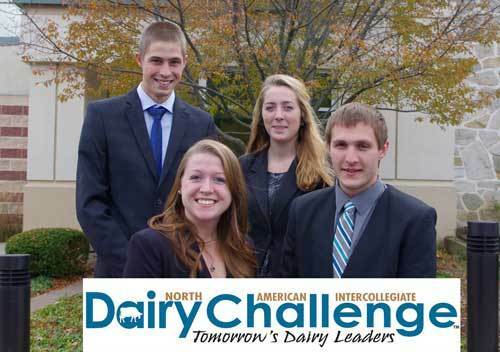 Back row (left to right): Lucas Senn, McGill University; Caitlin Moriarty, Vermont Technical College. 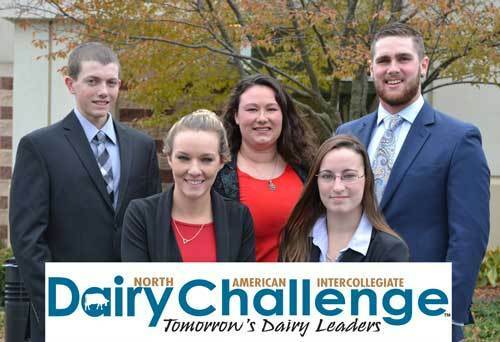 Students on Team 12 - Semex earned first place among teams evaluating Willow Behrer Farms of Spruce Creek, Pa. Front row (left to right): Stephanie Luders, Morrisville State College; Katelynn Howden, Alfred State College. Back row (left to right): Matthew Driscoll, Delaware Valley University; Jamie Kayhart, SUNY Cobleskill; Benjamin Young, Cornell University. 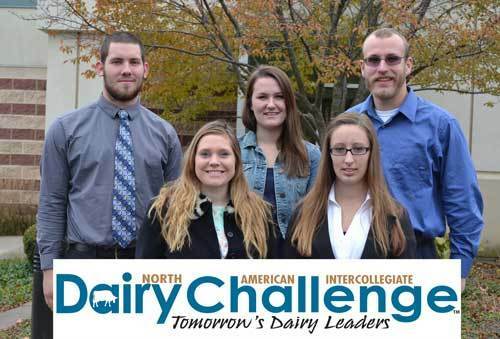 Students on Team 20 � Merck Animal Health earned first place among teams evaluating Ti Glo Farm of Howard, Pa. Front row (left to right): Heather Theriault, University of Maine; Jaycie Staring, SUNY Cobleskill. Back row (left to right): Matthew Burns, McGill University; Shannon O�Sullivan, Morrisville State College; Jacob Dueppengiesser, Cornell University.